It’s hard to explain something you have to see to believe. Nevertheless, DELTA has teamed up with NCSU Libraries and other partners to spread the word about the incredible capabilities and uses of virtual reality (VR) in education. DELTA began working with VR nearly three years ago. Realizing its importance and potential in the educational realm, the DELTA Grants team incorporated the 360° technology into two projects — a virtual tour of Grand Asia Market for a Community Food Security course and eFIRE. eFIRE is an interactive microsite created to teach individuals the importance of and how to conduct prescribed fires without having to personally venture into forests. The pictures and recordings of the prescribed burns were documented through GoPro cameras attached to a rig that allowed for a 360° view of the fires, trees and shrubbery. This interactive panoramic view makes onlookers feel as if they are standing outside with the instructor. Within the 2015-2016 grant cycle, DELTA has taken eFIRE one step further and incorporated some of its components into a fully online Fire Ecology course. The inclusion of the 360° videos complements the additional live webinars, personable faculty introductions and student created video research projects the course utilizes. These “very well produced” VR videos have become shining segments of the Fire Ecology experience. DELTA has also helped make great strides in improving nutrition courses by working with a range of individuals including Assistant Professor Suzie Goodell and Teaching Assistant Professor Natalie Cooke. Community Nutrition (NTR 420) students are required to create lessons and prepare to teach groups of community members on topics and skills utilized in the kitchen. A suggestion for improving the course, however, was the ability to get a feel for what it would be like to teach community members prior to the actual experience. Through a 2015-2016 DELTA Exploratory Grant, DELTA staff, nutrition students and instructors began creating videos of possible scenarios that could happen while working in the community. The videos show instructors teaching audiences that are being difficult or challenging. After watching the videos with a virtual reality headset like Google Cardboard, students will have group discussions to determine if the instructors handled the behavior appropriately. The groups can then see what would have happened had the instructor chosen one resolution over another. “Of course you can’t create everything, but the more tools we can give students and put them vicariously into that position, the better. We’re trying to create this experience where the student feels like they are put in the classroom and they are the teacher and they have to make a decision, but they’re not really there,” said Cooke. DELTA has also worked alongside Assistant Professor and Distance Education Coordinator Clint Stevenson to improve food safety and food science courses. Much like Goodell and Cooke, Stevenson wanted to give his students a glimpse of the real world without having to jump in head first. Through a DELTA Grant, Stevenson was able to create a VR tour of the Howling Cow plant, a tool he continues to use in his classes to show students a day in the life of working in a dairy processing plant. The tour has hotspots that allow students to learn more about particular areas of the facility. Virtual tours of Howling Cow and other manufacturing plants allow individuals to learn more about food science, equipment and appropriate food safety practices. “We’ve been communicating food science all wrong. We start off with facts and everything we know, but now we’re starting to move more into thinking about using VR to communicate it in a way that connects with students’ values and their culture,” said Stevenson. Stevenson’s extensive knowledge on the topic is being spread throughout his classes and to corporations and industries above him. He and his team are receiving external funding to do creative VR projects for artisan cheese makers, small dairy processors and even have a contract with a large dairy company with more than 70 plants nationwide. “We’re getting private funding to assist our stakeholders in their training programs but at the same time I’m reusing what we create for them in the college classroom. So that’s where it comes full circle,” said Stevenson. Through the incorporation of VR in the classroom, Goodell, Cooke and Stevenson are able to provide priceless, real-world, practical learning experiences to their students. 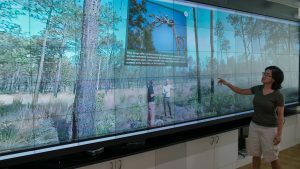 An offshoot of the work DELTA has done in VR and the connection with pockets of faculty experimenting with the technology, a natural partnership with NCSU Libraries whose purpose is to support faculty was imminent. DELTA’s partnership with NCSU Libraries aims to spread awareness of the cutting-edge technology across campus through a group called Virtual Reality Interest Group (VRIG). 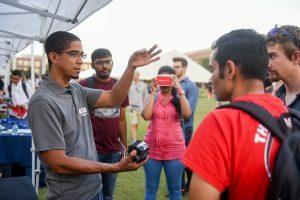 “We felt like it would be good to bring together the people we knew individually who were working in the space of VR and get them to come together and talk about it — share their issues, their projects, help people make connections to each other and help us better understand what’s going on in the campus community and help us promote the resources we have available,” said NCSU Libraries Associate Head of Learning Spaces and Services David Woodbury. The partnership recognizes the need for cohesiveness between different departments and colleges. VRIG will help encourage these relationships and make connections. “The courses that we’ve applied VR to show it applied in different ways. We have the observation, the instruction, the evaluation, training and field trips,” said DELTA Lead Instructional Designer Cathi Dunnagan. However, although there have been multiple courses involved in varying projects, the one thing they all have in common is the utilization of the same technology. VRIG was created to take what these instructors know about VR and spark conversations between NC State faculty and staff who may be interested in similar projects. Through this informal environment, people across all disciplines are encouraged to share what they are doing in the classroom and on campus. This communication prevents project duplication and raises awareness about new equipment and faculty capabilities. “We want to establish a sense of community and want to connect the dots and have an awareness and sharing opportunities to collaborate,” said Lead Instructional Designer Bethanne Tobey. Similar interests have also helped glue NCSU Libraries and DELTA together. Woodbury recalls that as VR was “picking up steam,” DELTA was simultaneously working on 360° video projects. DELTA’s Associate Director of Creative and Multimedia Mike Cuales sought out the library to use the Makerspace to build camera rigs for 360° cameras. The two entities worked on the Makerspace video together. Thanks to VRIG, news on this invaluable resource of lending and best practices is spreading across campus and sparking new ideas for those dedicated to giving their students the best learning experience possible. DELTA and NCSU Libraries have also teamed up to spread the word about VR through conferences and events such as the East Coast Games Conference (ECGC). Cuales initiated the partnership and encouraged DELTA’s and the libraries’ collaboration with computer science and design. 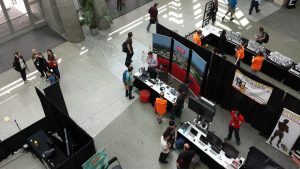 The VR Village made a big impact at ECGC this year. Collaborators from VRIG were able to showcase a range of VR content developed to enhance online learning. A number of projects were showcased including materials from the NTR 420 recordings and a physical architectural model accompanied by a VR visualization of the structure and landscape. Haptic gloves for rehabilitation and a glimpse of live 360° video were also presented, an interaction that can only be described as an out-of-body experience, according to Cuales. Other universities from the Research Triangle area were present at ECGC, in addition to major buyers for companies such as Amazon and Best Buy. NC State’s presence at the conference showed the university’s competitive leg up in the world of virtual reality, an attractive appeal to graduate students. Over the past year, DELTA has dedicated a great portion of its services to providing new learning opportunities to students through the use of VR. In the 2016-2017 cycle, DELTA has four new VR-based projects. VR’s fascinating way of transporting users to different environments helps students learn about places without having to personally be there.